Common dolphins are playful, fast-swimming creatures, famous for their acrobatic behavior. They often surf waves behind or adjacent to boats, providing an exciting show. There are two species of common dolphin, long nose and short nose. Both species have intricate hourglass shaped patterns along their sides, a dark-gray dorsal (top) side and white ventral (bottom) side. Common dolphins can grow to 2.3-2.6 meters (approximately 7.5-8.5 feet) long and weigh up to 135 kilograms (approximately 297 pounds). Adult dolphins can reproduce when they are 3-4 years old. Common dolphins travel in herds of hundreds or thousands of animals and exist worldwide in tropical and temperate oceans. Long-beaked common dolphins are more often seen near coastal areas, while short-beaked common dolphins live in the open ocean. Dolphins often work together to catch fish, their main food source. They herd them into a tight ball so that the fish are easier to catch. Squid and octopus are also tasty snacks for dolphins. Dolphins are at times accidentally caught in fishing gear. They are attracted to areas where humans go fishing because they also like to catch and eat fish. Despite these occasional accidents, common dolphins are the most numerous dolphin species in the world with a population estimated to be over one million. Map showing global distribution of the common dolphin. Chart illustrating the differences between dolphins and porpoises. 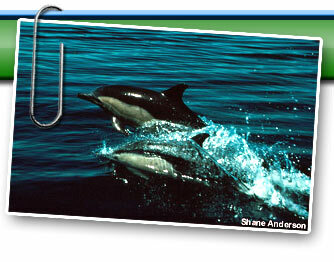 Common dolphin photo gallery and fact sheet on behavior.